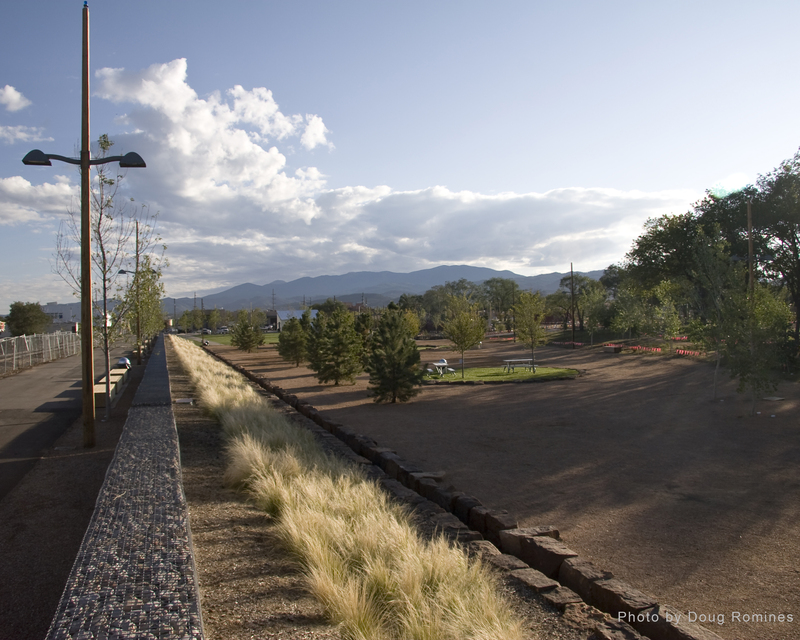 This new park was envisioned as a place of pleasure, an oasis for the community of Santa Fe. But the intent was also to create a place where people come to understand a new relationship between themselves and their environment. Could this park be where aspects of the history of this area are revealed, where a better understanding of the landscape and its relationship to water becomes apparent, where the various segments of the community encounter each other? Through the visceral experiences visitors have of plantings, rail lines, acequias, water and play areas can they come to a better understanding of the nature of this place? 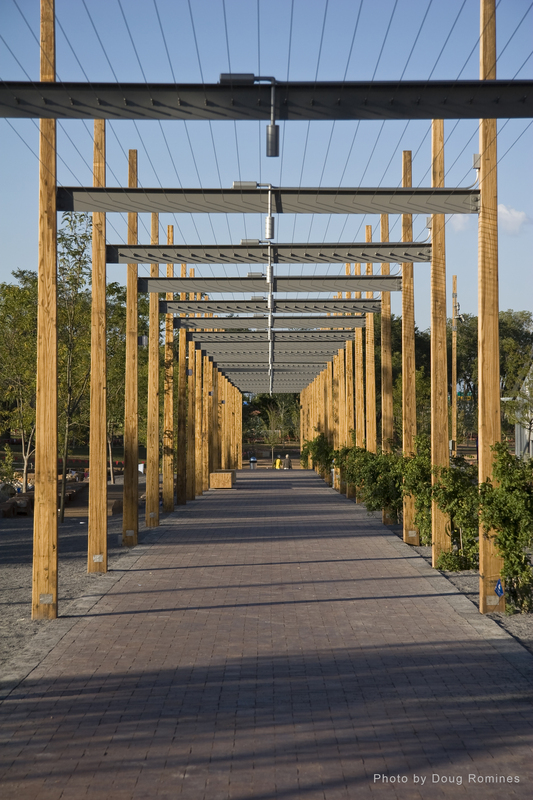 This thirteen-acre park built on the site of the abandoned railyards is the result of a community-initiated urban redevelopment project that took place over a twenty-year period. The collaborative team worked closely with a group of park stewards led by the Trust for Public Land. The project consists of the plaza, an alameda and bike path and a seven-acre park. 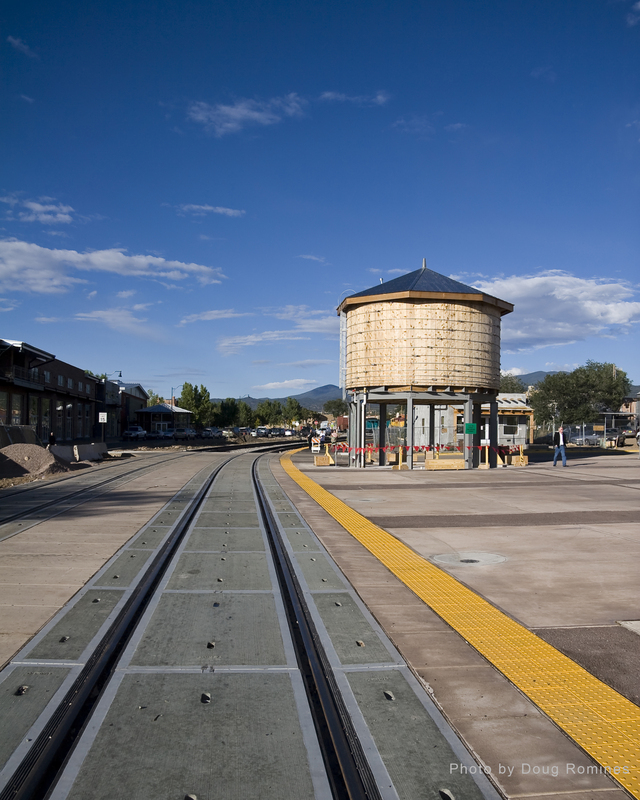 An elevated water tank like those traditionally used along the old rail lines immediately announces the importance of this element. Water collected from the roofs and hardscape at the north end of the project is stored above and below ground and then used in the maintenance of the plantings of the park. 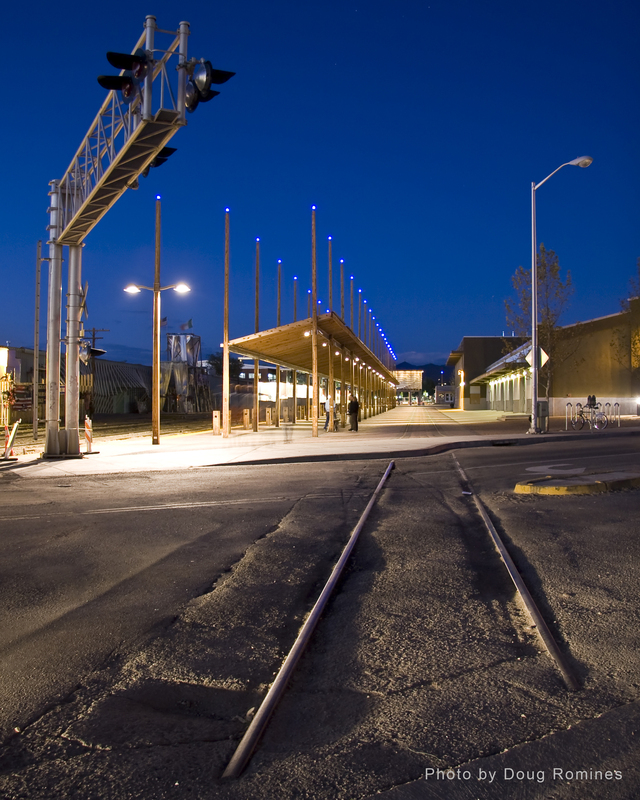 The path of the water moving from the north end to the south is noted by blue lights atop the utility poles that form the connecting spine of the project. In the park a bosque of trees lines the 400 year old Acequia Madre, an example of the traditional means of irrigation in this region. The acequia feeds the smaller Acequia Nina which runs to the south end of the park; along the way it sustains an example of the permaculture farming used in the pueblos in the southwest and a traditional Spanish Colonial garden. 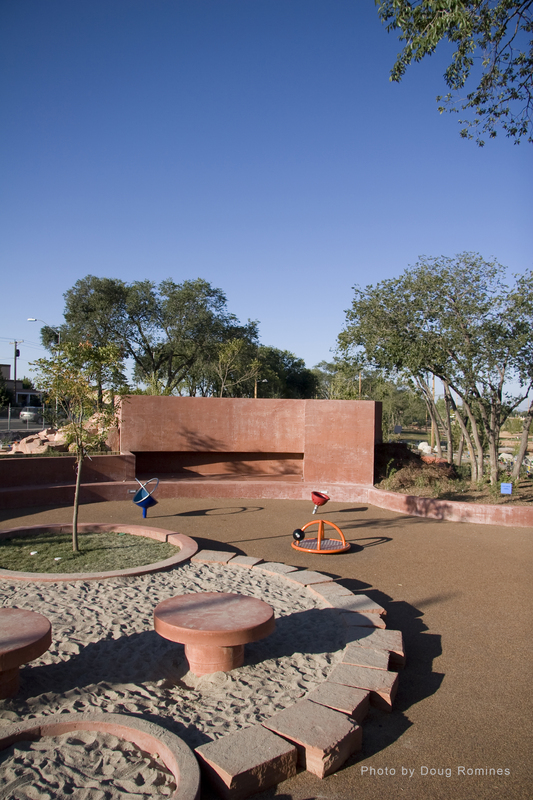 Xeric planting is used throughout the park and over four hundred trees have been planted to provide shade. The history of the site and the area becomes apparent as visitors are able to observe a functioning acequia, follow paths that mark the old rail lines and spurs, and sit in a circular ramada that recalls the old round house for engine repairs that once existed nearby. The linear layout of the park elements reflects the site’s past connection with the railroads. The materials used in the park—utility poles for the ramadas, steel rails lining garden walks, wooden benches in the form of stacks of wood—recall the industrial history of the park. Visitors are engaged by the layout of the park. 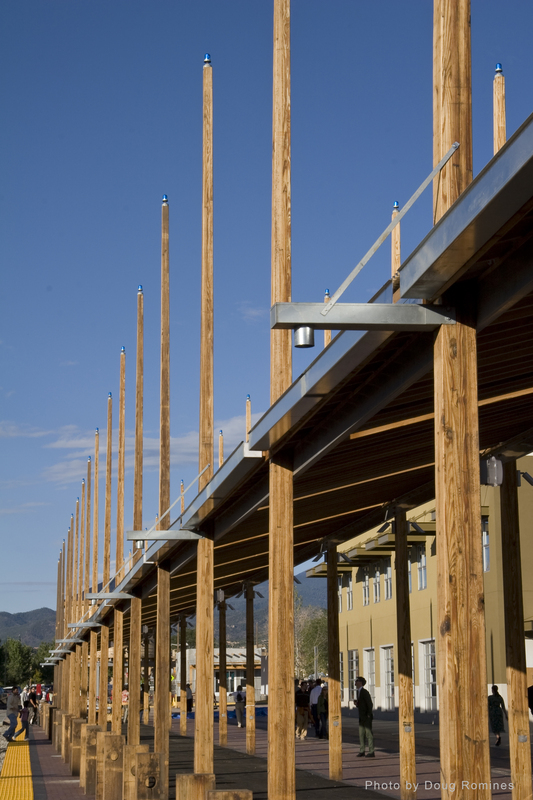 The spine of utility poles used for the lighting, alameda and long ramada connect all the parts of the project while the linear rail gardens visible as you approach the park from the north draw the visitor in. The large circular ramada surrounded by pine trees and hung with porch swings acts as a front porch to the park. The grade of the site has been lowered which, along with stone-filled gabions at the edge of the site, buffer visitors from the noise of the traffic. A sloped performance lawn adjacent to an open field accommodates two to three thousand visitors. Another aspect of the western landscape is reflected in the park: a series of circular areas defined by stones, wooden walls or trellises recall the circular irrigated fields seen from the air as well as the underground chambers of Native American architecture. These all define gathering places in the park- from the grass picnic circles to the circular rose garden at one of the main entrances. 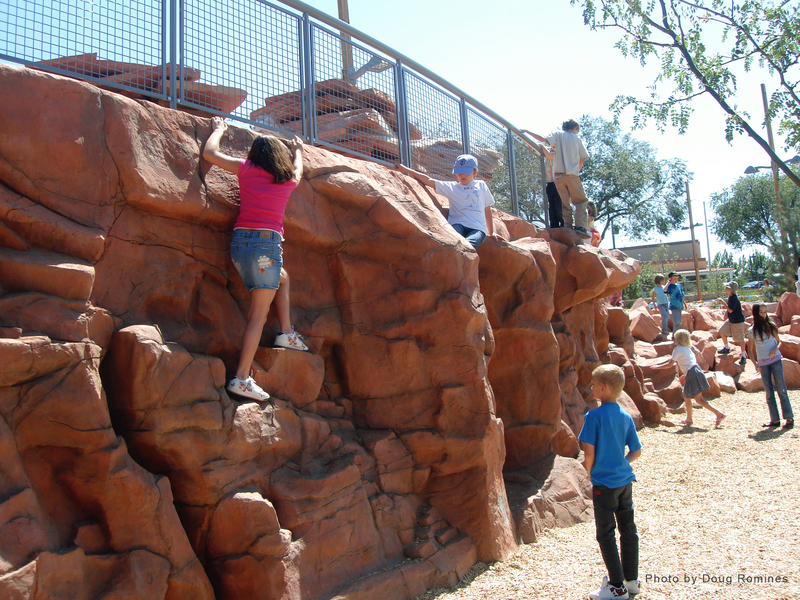 At the center of the park is a gathering place defined by a ring of boulders that is also a children’s playground. There is a curved embankment that has a series of slides on one side with a climbing wall at the back. On the opposite edge there is a toddler’s area made up of circles of sand, grass and trees. An adjacent rock mound configured for an overview of the area also shows the water runoff pattern of a hilltop. A small stepped area for gatherings and performances as well as a stone labyrinth adjoin the mound. A field of posts and climbing nets occupy the area between the two edges of the larger play circle. In this central area of the park, the intention was to create a gathering area that integrates children into the heart of the park. There are places to climb, hide, be challenged and hang out, while others may picnic, perform or read. The alameda and plaza at the north end of the park is another gathering area. It will be activated by performances, festivals and the presence of the farmer’s market. On market days produce is sold from pickup trucks and under awnings. In as many places as possible situations have been set up for people to meet and engage with each other. Through repeated trips, there is the possibility that visitors to the park will discover new ways to think about planting their yards or handling the water they use; there will be the opportunity to encounter other members of the community outside their usual family or social groups; the previous uses of this land will become apparent. 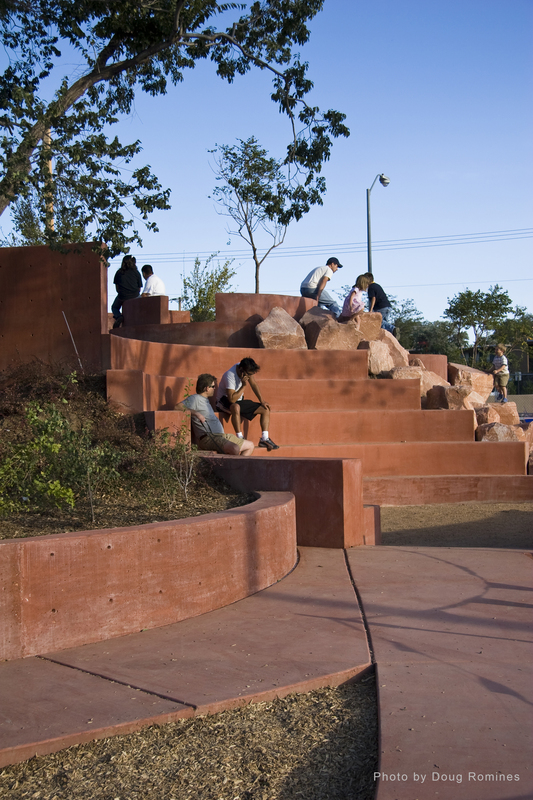 This public space in Santa Fe provides the opportunity for new bonds to be formed between the residents of this city and their surroundings.